The year 2010 marked the fiftieth anniversary of the inauguration of Brazil’s capital, Brasilia. Designed by architects Lúcio Costa and Oscar Niemeyer, it has since become one of the most famous and widely studied urban planning projects. Niemeyer’s cathedral, Catedral Metropolitana Nossa Senhora Aparecida; his building for the national parliament, the Congresso Nacional; and the city’s 224-meter television tower have become icons of twentieth-century architecture. 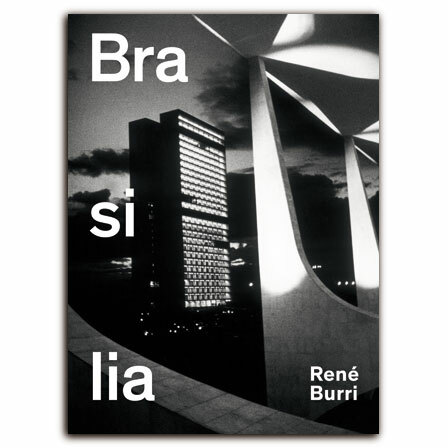 René Burri (1933–2014), an internationally celebrated Swiss-born photographer and member of the legendary cooperative Magnum Photos, visited the city for the first time on a long journey around South America in 1958, when most of Brasilia was a vast building site. He returned many times over the next thirty years, documenting the growth and development of this urban utopia. Besides documenting the buildings in various stages of completion, Burri took portraits of Niemeyer and his workers and photographed Brasilia’s street scenes and people: workers with their tools, machinery and building materials, pedestrians on the newly finished streets and squares, and aerial views of the city’s first slums abutting brand-new blocks of residential buildings. His images capture the strong sense of a new era and a vibrant atmosphere of hard work and strain; they reflect the huge dimensions of the landscape and the great scale of this project and its ambition to design and build a new capital—and fill it with life. Complete with essays by Burri and eminent architect and scholar of architectural history Arthur Rüegg, René Burri. Brasilia allows readers to look at an extraordinary city through the eyes of an exceptional photographer. In 2011, René Burri was awarded the Swiss Press Photo Lifetime Award for his work.